Everyone loves to relax in the evening with some lovely red wine and cheese. It works every time, right? Or does it? In fact, pairing red wine and cheese isn’t all that easy. Many red wines either stifle the flavour of the cheese or taste off when served with cheese. One reason for this is the tannins found in red wine, which don’t go well with very many types of cheese. That is why it can be so difficult to pair red wine with your cheese – and why you’ll often have more luck with white wine or beer. It is of course possible to serve red wine with your cheese platter, as long as you bear in mind the following rules of thumb. So before popping open that expensive bottle of red you bought on holiday in Italy or France, read on. Many of the red wines we drink are dry and heavy. These are wines that generally go well with meat and rare steaks, but not with cheese. Heavy wines can easily overpower lighter cheeses, such as brie. But if you do want to drink your heavy wine with cheese, then go with stronger, aged cheeses, such as a lovely Aged Gouda or Cheddar. Aged Italian cheeses, like Parmesan, Pecorino and Grana Padano, also go nicely with a heavy red wine. Most red wines contain tannins – or tannic acids – which come from grape skins. The amount of tannins in red wine differs greatly. They are found in high concentrations in young wines, but generally fade with age. In fact, tannins are what make it possible for wines to develop over many years. We see this in the Italian Barolo wines, for instance, which are extremely heavy with tannins when they’re young, but grow softer and more flavourful with age. High-tannin wines go very well with aged cheeses that are full of flavour. The tannins in the wine attach to the proteins and fats in the cheese, effectively rinsing the palate after each bite. However, with younger cheeses, tannins attach too much to the rich flavour, causing the cheese to taste chalky and metallic. If you are serving a selection of light cheeses, such as brie, red smear cheese and other white mould cheeses, it’s a good idea to serve a light and fruity red wine. Pinot Noir or Gamay are especially lovely – and you rarely go astray with a light Bourgogne or Beaujolais, both of which come from north-eastern France. If you like bubbles, try serving an Italian Lambrusco with your light cheeses. We’re not talking about the overly sweet, low-budget Lambrusco, but rather the higher quality varieties that also come out of the Italian wine district and are often quite reasonably priced. It’s not uncommon to serve grapes, raisins and dried fruit with cheese. And for good reason: cheese loves sweet company, and this also applies to the wine – even when it’s red. Amarone therefore makes an excellent cheese wine, as it’s a red wine made from dried grapes, which tend to be both heavy and sweet. However, it’s still important to remember to serve cheeses that match the heavy, flavourful wine. The disadvantage is that a good Amarone is often quite expensive. You can also go all out and serve a genuinely sweet red wine with your cheese platter. 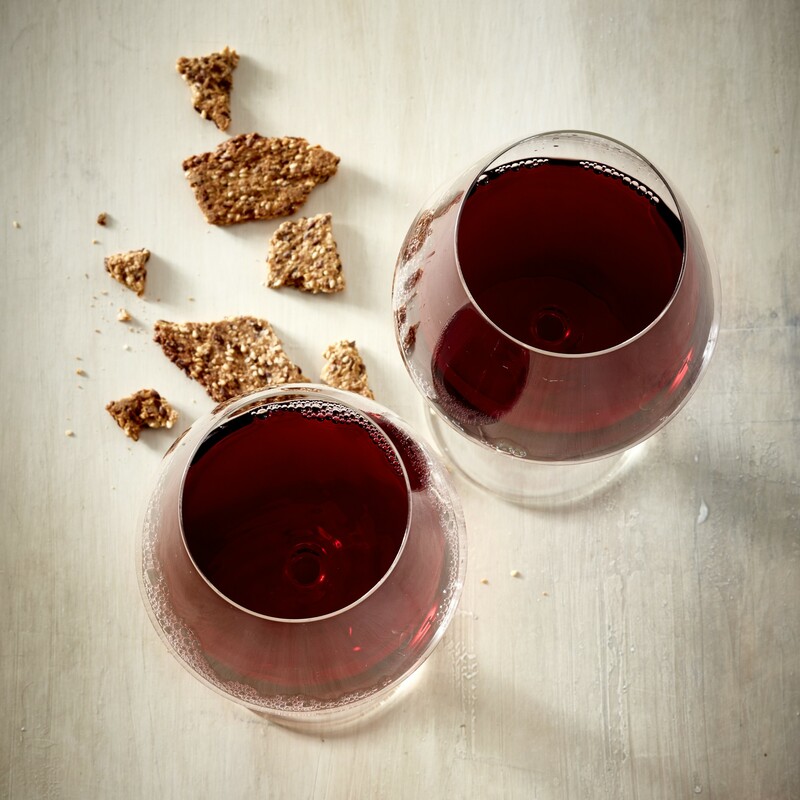 There are plenty of wonderful red dessert wines – some are even quite acidic, which is another plus – and they generally go quite well with heavy cheeses and blue cheeses, where the sweetness balances out the saltiness. Fortified wines, like port, sherry and Madeira, also go very well with rich cheeses. A classic match is English Stilton and port, but other blue cheeses also taste lovely alongside a glass of sweet, flavourful port. Another good rule of thumb is to match the style of the cheese and the wine. The more unusual a wine is, the more unusual a cheese you can pair it with. If you have a light cheese you’ll want to serve it with a light, natural wine. However, if you have an old, aged red wine – such as a classic old Bordeaux – it should be served with an elegant and firm aged cheese. The two old chaps go hand in hand and suit one another perfectly. Finally, if you have a sweet, fruity wine with heavy berry notes, try serving it with a very ‘cheesy’ cheese. For instance, an aged brie with notes of ammonia. As you can see, there are many possibilities and pitfalls. The best advice is therefore always to experiment – serve several different wines, if you like. This will increase your chances of finding a good match. It’s also a good idea to test both the cheese and the wine before deciding. Have an open bottle of that wonderful Italian red left over from your steak or pasta dinner the other night? Taste it with a bit of cheese. Do they work well together? Or should you serve something else with the cheese? In the end, let your taste buds decide. Just remember that it’s a shame to ruin an excellent wine or wonderful cheese with a bad pairing simply because you couldn’t wait to try that particular wine or cheese.